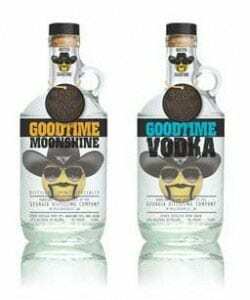 Average Joe’s Entertainment’s Colt Ford is launching his own signature liquor line, Goodtime. Ford aligned himself with the Georgia Distilling Company and United Distributors to produce Goodtime Moonshine (90 proof) and Goodtime Vodka (80 proof), which hit stores today (10/19). Goodtime will initially be available throughout retail stores in Georgia and Tennessee. The partnership was announced yesterday (10/18) at a press conference at the United Distributors offices near Atlanta.